Spock, the author states, is “a comprehensive testing framework for Java (and Groovy) code that can help you automate the boring, repetitive, and manual process of testing a software application. Spock is comprehensive because it’s a union of existing testing libraries”—specifically JUnit, Mockito and JBehave. It also is influenced by several others. To emphasize that point, Kapelonis shows how to use Spock with the Maven build tool first, before he delves into how to use Spock with the Gradle build tool. The book is divided into three major parts: (1) Foundations and brief tour of Spock; (2) Structuring Spock tests; and (3) Spock in the Enterprise. Two appendices deal with installing and using Spock, plus getting your IDE set up, and using the book’s example files. Java Testing with Spock is a comprehensive guide to learning how to do Java (and Groovy) testing with Spock, and it is generally well written and adequately illustrated. I chose to try the Groovy-Gradle approach, with Eclipse as my IDE. And I did run into some awkward moments trying to get Eclipse Mars.2 to play correctly. The Groovy-Gradle plug-in from the Eclipse Marketplace was for earlier versions of Eclipse, and so was the Spock plug-in. After some tinkering and reconfiguring, I was able to get things working together and do some Java and Groovy tests. To be fair, I was doing this on a kludged-together Windows 10 machine that definitely is no development powerhouse. And I did not have time to try out the Maven approach, but I have used Maven in the past, and the author’s instructions and examples for Maven look solid. Java Testing with Spock is a good, helpful how-to book for anyone who wants to know more about putting the Spock testing framework to good use at all levels of Java development. If you have worked with the decade-old Spring framework, you know well that it has a long history of providing configuration headaches for developers. The new Spring Boot framework, on the other hand, literally brings much-needed simplification and automation to the process of using Spring. And it can put some refreshing fun back into application development. You do not need a lot of Spring experience to benefit from this book. You do need some Java background, and it is helpful to have used Groovy, Gradle and Maven a few times. But the book’s text is written smoothly, and it is well illustrated, with numerous code examples and a few screen shoots. So Java developers who are fairly new likely can use it and pick up new skills. While going through the book, you develop a reading-list application using Spring Initializr, Spring Boot, Spring Tool Suite, and other tools. In the project, you “use Spring MVC to handle web requests, Thymeleaf to define web views, and Spring Data JPA to persist the reading selections to a database,” Craig Walls explains. Initially, at least, “an embedded H2 database” is employed during development. Four appendices also are presented: Spring Boot developer tools, Spring Boot starters, Configuration properties, and Spring Boot dependencies. Bottom line: with Spring Boot providing much of the heavy lifting, you likely will gain better feelings about the venerable Spring framework. You may even wind up with a healthy new respect for it. And Spring Boot certainly should add more years to Spring’s usefulness and viability in the marketplace. Clojure seems to be afflicted with a measles-like outbreak of parentheses, and it generally just looks strange to many software developers. And there’s a good reason for that, as this book’s two author point out in their recently released second edition. I have been tinkering with Clojure on the side, at random spare moments, for more than two years, using a disorganized approach of looking at web postings, building and modifying simple projects that others have posted, and sometimes looking at Clojure how-to books as time permits. From my perspective, Clojure in Action, 2nd Edition fills a beginner’s need for a friendly, well-organized approach to learning the language and putting it to work effectively. Developers already working with Clojure can benefit from having this book, too, as a handy reference. It covers a lot of ground, using reasonably short paragraphs and offers many short code examples to illustrate its key points. Clojure is not a language for absolute beginners. The authors assume “you’re familiar with an OO [object-oriented] language like Java, C++, Ruby, or Python, but no background in Java, Lisp, or Clojure is required.” They also assume you have downloaded Clojure and gotten it working on your PC. You can read more about Clojure and download it here. This expanded 2nd edition states that it covers the “new” features of Clojure 1.6. Of course, Clojure already is up to 1.8, but I have tried many of the code examples at various points in the book and have not encountered problems while running 1.8. The Second Edition‘s two main authors and five assisting authors are members of the Groovy core team. And their book spent a lot of time being reviewed and tested by readers in the Manning Early Access Program (MEAP) before it was formally released. So it likely has a better preparation record than many programming books currently on the market. Groovy in Action‘s front flap indicates that the book covers Groovy 2.4. Groovy recently was up to version 2.4.3, but the programming language has maintained a good track record for supporting backward compatibility. Indeed, I tested random selections of the book’s code samples using version 2.2.0 and its Groovy Console, and programs compiled and ran without problem. In short, there is no shortage of useful content in Groovy in Action, Second Edition. 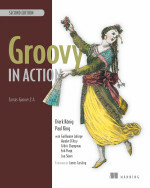 Get Groovy in Action, Second Edition here, at no extra cost. Java 8, we were sometimes assured, would just be Java 7 with a few slick new (or past-due) features added. Actually, now that it’s here, Java 8 represents “the biggest change to Java in the 18 years since Java 1.0 was released,” the three authors of this fine new book point out. Of course, news of “big changes” seldom sits well with developers who have spent countless hours learning and getting comfortable with one particular version of a programming language. And many coders and companies will continue sticking with Java 7 for a while longer, because it still works. But the adoption pace for Java 8 keeps picking up. So, to misquote an old sci-fi slogan, resistance soon will become somewhat futile. Lambdas, streams, and functional-style programming capabilities are Java 8’s headline additions. And there are some other major and minor additions, as well, including default methods and a new Date and Time API. 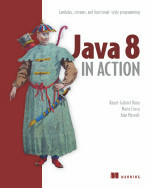 Java 8 in Action does an excellent job of introducing these new capabilities, and the book offers many short code examples and other illustrations to show how to put the new Java 8 capabilities to work. Indeed, short (and shorter!) code is one of the hallmarks of Java 8. “In Java 8 you can write more concise code that reads a lot closer to the problem statement,” the writers emphasize. To illustrate that point, they offer a five-line example of verbose Java 7 code and follow it with a one-line Java 8 code example that accomplishes the same thing. Other examples also drive home the coding efficiencies that Java 8 can offer. This review barely dents the surface of this excellent how-to book’s contents. Whether you are learning Java now or you are a Java developer who wants to keep your coding skills up-to-date and sharp, Java 8 in Action should be a book you will read soon. The increasingly popular Scala programming language runs on the Java Virtual Machine (JVM). And “Java and Scala stacks can be freely mixed for totally seamless integration,” Scala’s website proudly trumpets. Should I learn Scala and blend it with Java? Should I take up Scala and use it instead of Java? Should I just keep my head down, ignore Scala, and focus on getting better at developing with Java? Thomas Alexandre’s well-written new book, Scala for Java Developers, clearly is aimed at those who would much rather add Scala to their skills and resumes than attempt to hide from the changes Scala can offer to Java development. However, Alexandre’s new how-to guide does not try to browbeat developers into abandoning Java and pledging allegiance to Scala alone. Instead, Alexandre shows how the two programming languages can be used together. And he demonstrates how Scala solutions often can be shorter and less complex than their Java equivalents. Decisions regarding how far to go with Scala remain with the reader. Yet Alexandre and his numerous code examples make a compelling case for becoming at least reasonably familiar with the language and experiencing how easily it can integrate with Java. Chapter 1: Programming Interactively within Your Project – Includes advantages of using Scala, learning Scala via the REPL, and performing operations on collections. Chapter 2: Code Integration – Focuses on creating a REST API from an existing database, adding a test in Scala, setting up Scala within a Java Maven project, and showing how Scala and Java work together despite some differences in code style. Chapter 3: Understanding the Scala Ecosystem – Includes inheriting Java Integrated Development Environments (IDEs), building with Simple Build Tool (SBT), using Scala worksheets, working with HTTP, and using Typesafe Activator. Chapter 4: Testing Tools – Writing tests with ScalaTest and testing with ScalaCheck. Chapter 5: Getting Started with the Play Framework – Getting started with the classic Play distribution, getting started with the Typesafe Activator, the architecture of a Play application, authentication, and practical tips when using Play. Chapter 6: Database Access and the Future of ORM – In this case, ORM is Object Relational Modeling. Chapter topics include integrating an existing ORM – Hibernate and JPA, dealing with persistence in the Play framework, replacing ORM, learning about Slick, and scaffolding a Play application. Chapter 7: Working with Integration and Web Services – Includes binding XML data in Scala, working with XML and JSON, and handling Play requests with XML and JSON. Chapter 8: Essential Properties of Modern Applications – Asynchrony and Concurrency – Covers the pillars of concurrency, the async library – SIP-22-Async, and getting started with Akka. Chapter 9: Building Reactive Web Applications – Includes describing reactive applications, handling streams reactively, experimenting with WebSockets and Iteratees in Play, learning from activator templates, and playing with Actor Room. An enterprise service bus (ESB) can help you link together many different types of platforms and applications–old and new–and keep them communicating and passing data between each other. Mule in Action, Second Edition, is a comprehensive and generally well-written overview of Mule 3 and how to put its open-source building blocks together to create integration solutions and develop them with Mule. The book provides very good focus on sending, receiving, routing, and transforming data, key aspects of an ESB. More attention, however, could have been paid to clarity and detail in Chapter 1, the all-important chapter that helps Mule newcomers get started and enthused. This second edition is a recent update of the 2009 first edition. Unfortunately, the Mule screens have changed a bit since the book’s screen shots were created for the new edition. Therefore, some of the how-to instructions and screen images do not match what the user now sees. This gets particularly confusing while trying to learn how to configure a JMS outbound endpoint for the first time, using Mule Studio’s graphical editor. The instructions seem insufficient, and the mismatch of screens can leave a beginner unsure how to proceed. Of course, this book is not really aimed at beginners–it’s for developers, architects, and managers (even though there will be Mule “beginners” in those ranks). Fortunately, it soon moves away from relying solely on Mule Studio’s graphical editor. The book’s examples, as the authors note, “mostly focus on the XML configurations of flows.” Thus, there are many XML code examples to work with, plus occasional screen shots of the flows as they appear in Mule Studio. And you can use other IDEs to work with the XML, if you prefer. Overall, this is a very good book, and it definitely covers a lot of ground, from “discovering” Mule to becoming a Mule developer of integration applications, and using certain tools (such as business process management systems) to augment the applications you develop. I just wish a little more how-to clarity had been delivered in Chapter 1.